So you’re looking for the best fog machine out there? In this guide, we’ll cover our favorite fog machines for filmmaking, as well as cover the dos and donts of using this kind of equipment. Let’s start by a taking a look at what exactly a fog machine is and how it works. A fog machine is a device which is connected to the circuit via a plug. There are also devices that work with a battery. The device has a compact design and weighs between 1 and 10 kg. In the professional field, this can be larger and heavier equipment, such as in film industry or entertainment events. The fog machine has the property that it can produce artificial fog. For this, the fog machine has a tank in which a fog fluid is contained. The fog machine ensures that the fog fluid evaporates and fog escapes from the device. The machine’s fog fluid must be refilled, resulting in follow-up costs that need to be considered when making an initial purchase..
Fog machines are mainly used when amplification of light effects is to be generated. This is the case in film / TV / video shooting, nightclubs, or even at private events. For certain scenes, it creates a special atmosphere, which is recognized as a highlight in the filmmaking industry. The fog machine is a device from which fog is released. The device is provided with a tank in which the fog fluid is located. Inside the machine, there is a heater from which the fluid mist can be generated. At the push of a button or remote control, a mechanism can be activated that allows the fog to release into the open air. However, for the fluid to evaporate, a particular system is needed. In the interior of the smoke machine is a heating element. Through this, the fluid is pumped and heated. Pressure is created so that the droplets of the fluid are broken up. The result is fog, which at the end of the heating coil intentionally escape from the device. A cloud of fog is released, which provides the fantastic lighting effects indoors or outdoors. Of course, the effect is more obvious and dynamic indoors. The properties of the mist can each be selected by settings or different fluids. Fog machines are always used where lighting effects are to be generated. The fog breaks in the light and the spatial effect is magnified. The resulting atmosphere contains something mysterious and strange. In addition, there is a sensational visual effect, which can be memorable for viewers of the film or TV show. The area of ​​use can also appeal to parties, nightclubs and other kinds of event use. When working with lasers, the rays are barely visible in the normal atmosphere. Now, when the fog machine is activated, the laser beams are visible and produce fantastic light pulses, which are very visible to the human eye. Let’s look at some of the best fog machines for filmmaking. 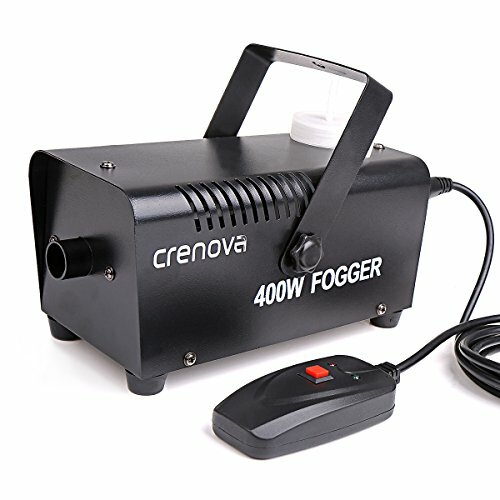 This smoke machine from Crenova was able to prevail with distance as the best fog machine and thus as test winner in a lot of studies. It offers an all-round complete package, because it is cheap, offers a high fog output of more than 600 m³ / minute and has a sufficiently large tank to produce continuous fog over a period of between one and three hours. When buying, make sure that you additionally order appropriate fog fluid, because this is not included in the delivery. The device is suitable for use indoors as well as outside. The warm-up time of the device is also very good with 4 to 5 minutes, so it is ready to use quickly. Due to the low price and the good output volume, the FM-02 by Crenova is equally suitable for beginners and semi-professional users alike. In particular, if you are using the machine fairly regularly (a weekly TV show shot on a sound stage, for example), then you’ll have great success with this piece of kit. 1. Great Fog effect: about 2, 000 cubic foot per minute. 2. 400 watt heavy duty heater, warm up time: 4-5 minutes. The compact fog machine by Showlite convinces with good usability and professional workmanship. The device has a wireless remote control, so you can easily control it, no matter where it is finally mounted. In addition to the remote control, a switch can also be connected by cable. The cable is generously sized with a length of 3 meters so that this variant also allows a comfortable and easy operation. With a capacity of 1,200 watts, the device generates 350m³ of fog per minute, but it takes about 7 minutes to warm up. The ceiling-mounted suspension and the case itself are sturdy and well-made, which means professional use is no problem. The tank has a capacity of 2 liters and thus ensures sufficient capacity for continuous use. However, keep in mind that the device may become very hot during extended periods of use, so it should not be operated unattended or should be installed in a location that is out of reach of the public. Which is always solid advice for filmmaking and video equipment at events and suchlike. The favorable fog machine from Dyntronic scores highly above all by the compact construction and the very favorable price. This relatively small machine works with 400 watts of power at a weight of only 1.3 kilograms, making it very mobile and universally applicable. For outdoor use, the device is not approved, but is suitable indoors for small sound stages and the like. Because it creates, after all, an output volume of about 50m³ per minute with a 0.3 liter tank capacity. Although this does not last a lengthy period of time, it still produces an ejection distance of about 3 meters. The device is operated via a cable remote control with 3 meters in length, which is sufficient for use on small sound stages and similar. Due to the very reasonable price and the sufficient volume for the interior, the device is ideal for the private sector in party rooms and on small stages as well as for professional use, for example, on location in relatively small confines. If you are looking for a very affordable device for use with interiors, then you will have many years of fantastic use from the Fog-400. The Beamz fog machine has a discharge distance of 8 meters and a high output volume of 600 m³, and is a professional device from electronics company Beamz, suitable for professional use on medium to large areas. Due to the DMX input and the possibility to be controlled both in master and slave mode, the S1800 is perfect for professional use in conjunction with appropriate DJ equipment and offers a very good price-performance ratio. In addition, the Bi-Directional fog emission works great forwards and upwards for first-class effects even when operating alone on large stages. With a heating time of about 9 minutes, it is ready for a professional use very quickly, which can be helpful in a pinch. The Beamz S1800 works with 1,800 watts and can be easily and reliably controlled via the supplied radio remote control. Due to the ejection upwards and forwards, the high-quality processed device is not suitable for ceiling mounting. But if you are looking for a cheap professional device with a very good performance, then it is worth buying the S1800 from Beamz. 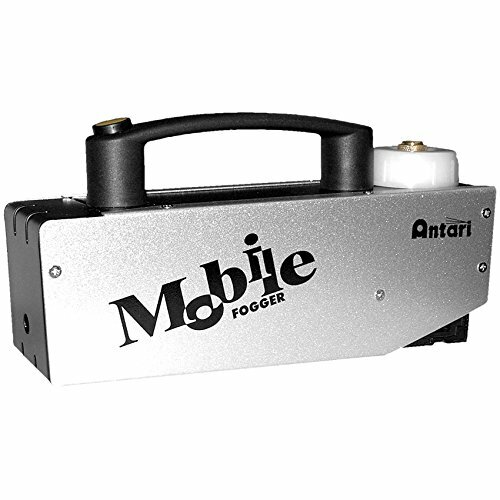 The Antari Battery Fog Machine is perfect for mobile use, but less for stages and celebrations than for mobile effects generation for film production and photography work. Because the output volume of 4m³ is not sufficient for creating fog effects in larger areas, but rather intended for targeted use. With 2.5 meters of fog output, it is well suited for this and achieves good effects in all tests that we looked at. Thanks to the low weight of just 2.7 kilograms, the good workmanship and a tank capacity of 100ml, it is perfectly prepared for this purpose. Due to the high price, the device is not suitable for use in the private sector, but is aimed at professional customers. What types of fog machines are there? Let’s discuss some of the different types of fog machines available. The hazer is able to produce a fine mist. This involves the use of water and a light fog fluid. With a very high air pressure, the fog is shot from the device. The room fills and becomes visible as a slight haze. If LED beams or floodlights are passed through the haze, visually impressive effects are created. The hazer is thus a device with which only a slight haze and no heavy fog can be produced. Ground fog has previously been generated using dry ice. However, the storage of dry ice is not easy, so that a system has been developed which generates artificial ground fog. The fog machine is filled with nitrogen or carbon dioxide for the ground fog so that it actually remains on the ground. However, professionals recognize some disadvantages with this type of ground fog equipment, which suggests that dry ice can still produce the most beautiful visual effects. Under this name, the fog device uses liquid CO2, which is under strong pressure. If the substance is pressed out of the nozzle, an immediate evaporation occurs. With this nebula, light reflections with many different colored rays can be generated. What do I have to look for when buying a fog machine? Before you buy a fog machine, it is essential that you pay attention to some points. There are different models and sizes. In addition, there are many manufacturers who want to bring their fog machine to the masses. Since the fog machine is an electrical device, you should pay special attention to safety. Take devices where no seal of approval and security features are included with a pinch of salt. In addition, there are models that are equipped with a battery, a remote control or other highlights. And remember, also, that the price ranges are often a reflection of the abilities and performance of the machine. How good is the fog produced? Before you buy a device, you should know how much fog the device can produce. The values depend on the manufacturer and, of course, vary enormously. There are devices that are essentially vaporizers. You can see from this value that the fog machine is suitable for small spaces. A powerful device that can under certain circumstances produce 140 m3 of fog per minute. For the small party cellar, a device with a capacity of 50 m3 per minute is perfectly adequate. How long is the warm-up time? If the unit quickly is ready for use, a brief warm-up period may be of benefit. This is especially beneficial when a spontaneous party is celebrated, a photo shoot is pending, or other events where it is not yet clear whether the fog machine is needed. A fog machine should not exceed a warm-up time of 10 minutes, if a quick use can be guaranteed. What are the tank contents and the fluid consumption? So that the fog machine does not have to be constantly refilled, it makes sense if the device includes a large tank. The fog machine should have a capacity of at least 0.25 liters. There are models with a capacity of 1.0 liter. These models can over a longer period of time work efficiently without a refill of fluids being necessary. So if you do not want to refill steadily, you should choose a device that has a large tank. There are also models that work with a hose system. These fog machines do without the internal tank. The hose connects the smoke machine with an external tank, so that it constantly provides the fog required. As with anything filmmaking equipment related, there are a number of variables when consider which fog machine to purchase. You need to consider things like use-case, budget and portability of the device. When we talk about use-case, we’re talking about what exactly you’re going to be using the fog machine for. What specific type of projects do you plan to use the fog machine on? Budget is an equally important factor. Some of these devices can be expensive. Is this something you’re going to use on set enough to justify buying one, or is it something you can rent when you need it? When it comes to portability, we’re considering things like travelling with th equipment and how large it is. If you’re going to need to pack it in a car, or even fly with it, regularly then these are all worthwhile considerations. We hope you’ve found this article on the best fog machine for filmmaking useful. Do you have a fog machine that you love to use? Drop it in the comments below.